Finkbuilt » Blog Archive » Rise of the Mini-quads! « Successful FPV Quadcopter Flight! Finkbuilt has been pretty much derelict for quite some time now. My last post 2 years ago celebrated my first successful FPV quadcopter flight. Success for me back then meant that I didn’t completely destroy the quad. Shortly after that post, I did destroy the quadcopter frame with a series of crashes, and put quadcopters aside for a while. Back when I first started playing with quadcopters, a common “starter” quad was built on a 450mm frame and that’s what I started with. Over the last year, I noticed that the pilots that I paid attention to on YouTube all started showing up with mini-quads, which are typically about 220mm-250mm motor to motor. These minis are built on tiny frames, but carry the same type of camera and radio equipment as bigger quadcopters. This year, I thought I’d see what the mini-quad buzz was all about and decided to get back into the game by building a 250 size FPV quadcopter. As it turns out, size does matter. There are some distinct advantages to flying smaller quads. You can fly in much smaller spaces than you would be able to with a larger machine. They are less conspicuous and less dangerous than the big birds. They are also less prone to crash damage, because they don’t weigh as much, and therefore don’t crash as hard. After a crash, you can usually just flip ‘em over and take off again. They are just more fun. In the few months that I have been flying quads again, I have learned way more than I did in my whole first season with a 450. I’m having a blast with this 250. The other thing i did this year was to purchase a few cheap toy quadcopters to practice with in the house. Back when i first started, there were only a few micro quads available, and they were not that cheap. Since then, multirotors have gone wild, and the toy market is now flooded with cheap-O quads. These toys make great trainers. 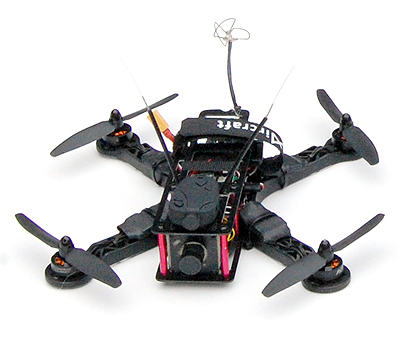 The skills you develop on these will transfer directly to any quadcopter that you fly. This entry was posted on Thursday, June 19th, 2014 at 9:01 pm	and is filed under Debris. You can follow any responses to this entry through the RSS 2.0 feed. Both comments and pings are currently closed.